Becoming Healthier with Sherrie: Daily Thoughts - What's Your Why? Danny Cahill (Season 8 Biggest Loser winner), and Michael Watkins (owner Fitness Together) are always asking, "What's your why?" As we go through our journey, if we remember our "why", we will push through those moments we become discouraged or feel we can't do something. When Michael is pushing me to go harder, faster, or not to set the bar down and all I want to do is stop, that's when it's important that I remember my "why". Why did I start? Why am I still here? Why is this important to me? We all have our various "whys". Some it might be their spouse or their kids, some it might be wanting to be able to play with their grandkids, or it could be they want to feel or look better. Sometimes you have to put yourself first, such as creating that time and space for working out, meditating, planning/prepping your meals and that's okay. 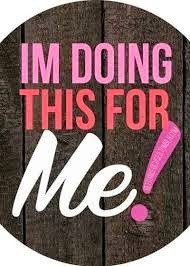 Because regardless of what or who your "why" is, when it comes down to it, you have to be the number one "why" and say....I'M DOING THIS FOR ME!! !